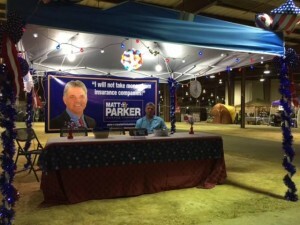 Louisiana auto body shop owner Matt Parker has challenged incumbent insurance Commissioner Jim Donelon — and he thinks the state’s open primary makes a win possible. Louisiana sends the top two vote recipients in the open primary, regardless of party, to the general election. Parker estimated the two Democrats in the race, Donald Hodge and Charlotte McGehee, would split between 30-35 percent of the vote, while he and Donelon, a fellow Republican, would split the remainder and advance. Both Democrats are saying the “exact same things” critical of insurance in the state, according to Parker, who said he stands a chance of picking up some of their supporters in the general election. “It’s not a party issue,” he said. People are “tired of incumbents,” and it’s “just ripe for change” now, according to Parker. He said the 40,000 miles he’s traveled around the state since January found “people are hurting” from the high cost of insurance. Trying to get auto insurance reform legislation passed was nearly impossible because of insurer lobbyists, he said. “We don’t have to worry about other politicians if we run for this office,” he said, adding that laws already on the books could help if enforced. In November, Parker said, he spent $10,000 for a professional survey. It found that 80 percent of Louisianans didn’t even know who their insurance commissioner was. When asked if they’d support an insurance commissioner who took hundreds of thousands of dollars from an industry they’re regulating, 86 percent said no. Asked if Republican Attorney General Buddy Caldwell would have had to sue State Farm had the insurance commissioner had been doing a proper job, 84 percent said no. “This guy’s extremely vulnerable,” Parker said of Donelon. Since Donelon took office in 2006, the state has frequently approved insurance rate increases and posted some of the highest rates in the country, according to Parker. Parker also pointed to criticism of the state’s insurance handling by Robert Hunter, Consumer Federation of America insurance director. Email messages to the Donelon campaign Friday have not yet been returned. Asked if Hurricane Katrina, which struck the state in 2005, might have been more to blame, Parker pointed to the tens of billions of net profits that year and the following year for the insurance industry. Insurers want to blame Louisiana’s higher rates on the hurricane, he said, but not all the Gulf States have such high premiums. Another false scapegoat: uninsured drivers, according to Parker. But Louisiana only ranked No. 16 for such drivers in 2012, according to the Insurance Information Institute’s summary of Insurance Research Council data. The problems are solvable without being unfair to insurers or collision repairers, Parker said, and pointed to California’s Proposition 103 as a model for property and casualty insurance reform. “We’re going to fix this mess,” Parker said. “It’s been fun,” he said. “It starts on the state level,” said Parker, who’s running his first campaign and “never in my life would have dreamed” he’d be a candidate. Shops too busy running a business to fight back — “that’s what the insurance industry wants to happen,” he said. Parker had a few lessons for collision repairers who opt to make their stand a campaign bid. He said he wished he’d started campaigning earlier, and he wished he’d raised more money. “The raising money part is a big issue,” Parker said. Parker had $48,225.17 on hand as of Sept. 14, according to his most recent campaign finance report. He’s raised about $67,871 overall this year. More than $41,750 of that total raised in 2015 could be easily identified as linked to the automotive industry (not counting sources like relatives connected directly to Parker) in a rough Repairer Driven News analysis, and it’s possible even more of Parker’s individual donors have ties to the industry. Donelon had raised about $251,037 from Jan. 1-Sept. 14, and another rough Repairer Driven News analysis found at least $80,800 of it easily identified as tied to the insurance industry. As with Parker, it’s possible that more of Donelon’s individual donors have insurance ties. Donelon had $337,146.57 on hand as of Sept. 14, according to his most recent campaign finance report. Parker has refused to take the insurance industry donations for which he’s attacked Donelon. Asked if donors from industries indirectly affected by an insurance commissioner– such as auto body shops — also posed a conflict of interest issue, Parker said no. He noted that Parker Auto Body was on State Farm’s direct repair program a year ago, doing $2 million and 850 vehicles in annual business. After leaving the program (and suing State Farm in the Louisiana action brought by shops against insurers), his State Farm business dropped to 150 vehicles. But a year later, Parker Auto Body isn’t on any DRP and business has rebounded thanks to consumer education. “They (shops) need to own that customer,” Parker said, rather than rely on insurer advertising through DRPs.